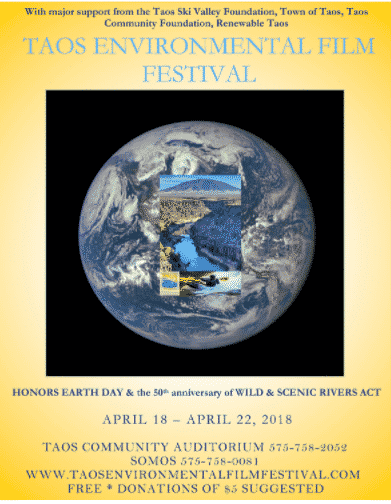 The 2018 festival honors the 50th anniversary of the Wild & Scenic Rivers Act. There will be school friendly 10am matinees and/or noon matinees plus 6pm & 8pm screenings of award-winning films and filmmaker Q&A’s through Sunday evening of April 22. A special Earth Day Celebration occurs on Sunday, April 22 from 11am-1pm at 115 Civic Plaza Drive at Bataan Hall UNM-Taos. All donations go to: Amigos Bravos, Rivers & Birds, Renewable Taos, Taos Center for the Arts & SOMOS.